Marvel's expansion period continues. The expansion manifests as a few new series, like Darkhawk, Sleepwalker, and Wonder Man, but it's more apparent in the number of books that go to bi-weekly status and the number of one-shots and annuals. Deathlok gets an ongoing series this year after last year's mini-series. 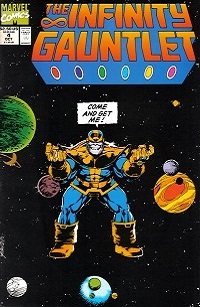 Infinity Gauntlet occurs this year, with a number of tie-ins and most major characters appearing in the main six issue miniseries. The success of that will kick off a cosmic sub-franchise over the next few years. The biggest news, though, is in the X-books. First there is the Muir Island Saga, a crossover bringing the X-Men and X-Factor together. And after that, a major shuffling of the line occurs. New Mutants becomes X-Force with a new #1. All the original X-Factor characters rejoin the X-Men, and a new (adjectiveless) X-Men book is launched to run alongside Uncanny. 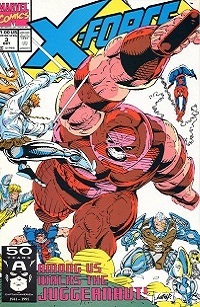 The first three issues of that X-Men series are Chris Claremont's swan song; he then departs from not just the X-Men but Marvel entirely, after over 20 years with the company. The cast of the X-Factor book is completely replaced, with a new focus and creative team (Peter David and Larry Stroman). Alan Davis returns to Excalibur, now writing the series in addition to penciling. The X-book relaunches feed into a growing speculator market, and we are also seeing an increased number of gimmick covers. Most of the top tier books are dealing with unstable creative teams. Larry Hama's run on the Avengers ends abruptly, resulting in fill-ins for the rest of the year. Walt Simonson quits Fantastic Four, and is replaced by Tom DeFalco and Paul Ryan. Todd McFarlane leaves Spider-Man, and Marvel, setting the stage for the upcoming artist exodus to Image. Erik Larsen moves from Amazing Spider-Man to replace McFarlane on the adjectiveless series. The other Spider-books are in writer limbo for much of the year waiting for a permanent replacement for Gerry Conway, who left last year. "Events" are becoming the norm. In a sense, events are just story arcs in a single title, but they feel like crossovers. They are more overtly named (e.g. "The Superia Strategem") and are numbered (e.g., part 1 of 6). In many cases they come with guest stars; sometimes many guest stars (e.g. "Round Robin: The Sidekick's Revenge"). Dan Slott is briefly an assistant editor, and starts to get writing credits in Marvel Comics Presents. Scott Lobdell graduates from Marvel Comics Presents and gets his first regular writing job, replacing Fabian Nicieza on Alpha Flight. J.M. DeMatteis returns to Marvel for a brief run on Moon Knight and what will be a long run on Spectacular Spider-Man. Joe Madureira debuts in Marvel Comics Presents. 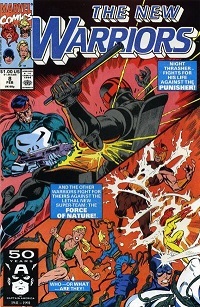 Marvel introduces a new fan club (after MMMS and FOOM) called WAM, Wild Agents of Marvel. It's announced in an extra-thick ad insert that appears in comics with a Nov cover date. Wolverine (as opposed to the Thing or Spider-Man) is the mascot. Prices hold steady, with regular books at $1. Hulk's three personalities are combined into a new merged Hulk. Cyclops and Madelyne Pryor's baby son is infected with a techno-virus and is sent into the future. The Avengers get a new charter under the United Nations. Thanos loses the Infinity Gauntlet to Adam Warlock, who has returned from the "dead" along with Gamora and Pip the Troll. The New Mutants become X-Force. Havok, Polaris, Wolfsbane, Madrox the Multiple Man, Strong Guy, and Quicksilver form the new X-Factor. The X-Men divide into Blue and Gold teams (one for each book). Annual crossovers include Korvac Quest, Kings of Pain, Von Strucker Gambit, Vibranium Vendetta, and Subterranean Wars. The Kingpin's criminal empire is torn down and he becomes a fugitive. It's revealed that a Skrull has been posing as Alicia Masters since 1984. New characters: Shatterstar, Feral, Domino (sort of), Gideon, Deadpool, G.W. Bridge, Kane, Shinobi Shaw, Fabian Cortez, Darkhawk, Sleepwalker, Crippler, Cyber, Paibok the Power Skrull, Squirrel Girl, NFL Superpro. And some new teams: the Dark Riders, the Pantheon, the Acolytes. Avengers #329-331 Avengers join UN. New lineup. X-Factor #65-68 1st Dark Riders & Shinobi Shaw. Baby Cable to the future. Fantastic Four #357-360 Lyja Laserfist revealed. 1st Paibok, Devos, Dreadface.